Ready to test out your investigative skills on True Detective? Tune in below! True Detective is an anthology crime drama created by Nic Pizzolatto for the premium cable network HBO. It’s not your typical crime scene drama or investigative series as it is comprised of three anthologies, each with its own intriguing story and complex characters. 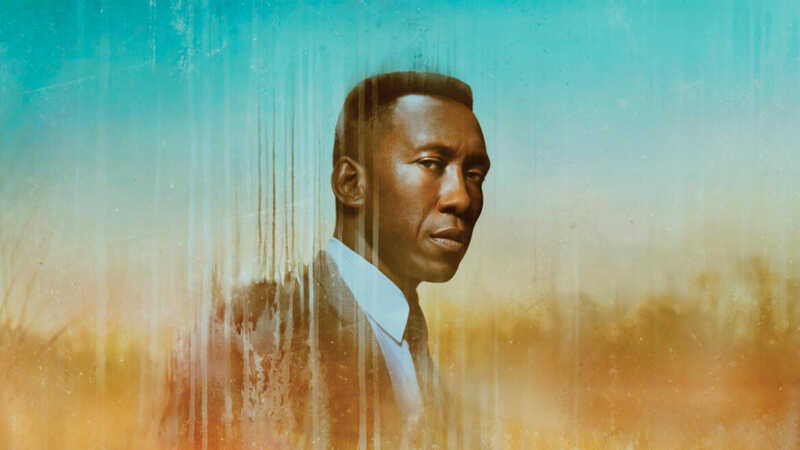 The third season which concluded in February 2019 took place in the Ozarks on three separate time periods, with Mahershala Ali playing the lead role as Wayne Hays, a state detective from Arkansas. HBO has confirmed the series for a fourth season on January 2019. You can usually watch True Detective on Sundays at 10/9 c on HBO although we can’t confirm if they’ll stick to the same schedule for season 4. If you’re outside the US, there’s a big chance that you don’t have HBO in your premium cable subscription. But don’t fret yet – we’ve got you covered. We compiled a list of official platforms as well as other streaming platforms you can try to watch True Detective from, at the comfort of your own home. Here we go! If you’re into watching True Detective on HBO’s official site, then we have good news. 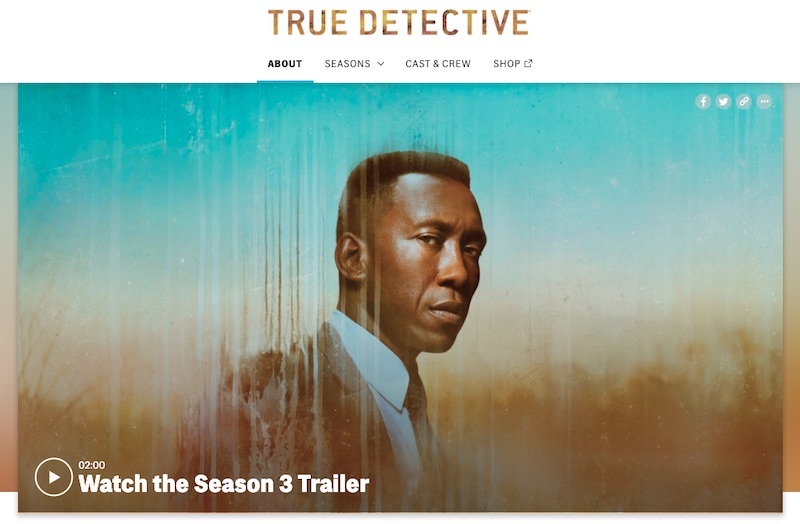 HBO not only offers all the episodes of True Detective on its website, but you get some additional bonus clips and behind-the-scene footage for being a loyal subscriber. If you have HBO in your premium cable subscription, you’re probably subscribed to its streaming service – HBO Now. If not, it’s fairly simple to subscribe. You don’t need a cable subscription so you can consider HBO Now as a standalone streaming platform exclusively for HBO titles and other partners. Sadly, it’s limited to US residents so if you’re looking forward to watching in on HBO, you’ll probably need a VPN and spoof your location. You can try subscribing to Hulu in case HBO is not available in your area. Its partnership with HBO makes all episodes of True Detective available on its site. The only difference about this and HBO is that there’s an option for an ad-free streaming experience for Hulu users. This goes without saying but you’re lucky enough if you have a Hulu account already since they only carry a few titles from HBO. Again, the downside is that Hulu is currently not available outside the US. So if your access is restricted, you’ll need a VPN that bypasses Hulu’s restrictions. You can scroll down to learn which VPNs do just that. Hulu Pricing: $7.99 with ads; $11.99 a month with no ads. If you have an Amazon Prime subscription, you can use it to watch True Detective episodes on the Amazon.com. You can choose between watching it through your Prime subscription, or you can add HBO and pay $14.99/month. Alternatively, you can also buy the entire 3 seasons or the episodes you want on SD or HD at a reasonable price points. If you’re 100% convinced, you can try it for free for 30 days. And as with other region-exclusive streaming platforms, this one is also restricted to the US, so you know the drill. Get yourself a VPN so you can also consider this an alternative even if you’re somewhere else! Google Play is a new player in the market for streaming platforms. It caters to a specific market – Android device and Google users. If you have an Android device and you want to stream True Detective at your fingertips anywhere you go, then give your Google Play Store a visit. 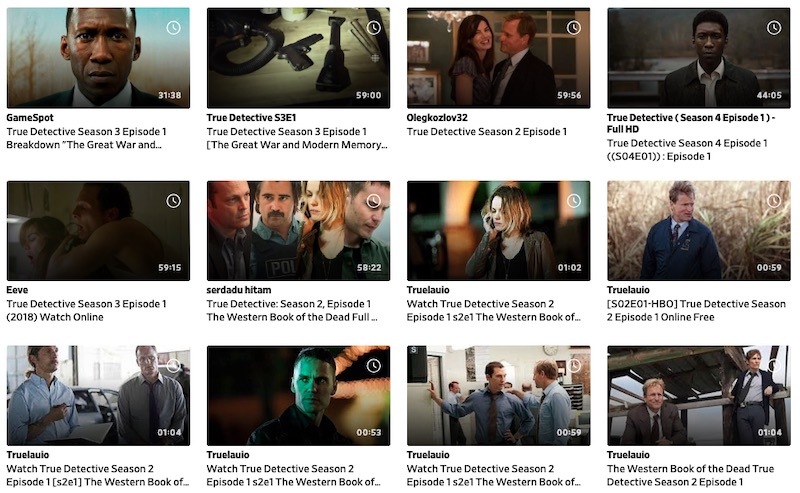 Just type in True Detective under the Movies and TV section, select the episode you want to watch or just buy the whole bunch and store it on your Android phone! If Google Play is for Android, then Apple iTunes is exclusively for iOS device users. The two platforms may seem quite similar at first glance, but Apple users tend to have multiple iOS devices they can sync and shows tend to be a tad more expensive on Apple iTunes. Fortunately, it offers a good bundle of seasons 1-3 altogether so if you want to binge watch all the episodes in one go, you can do that. 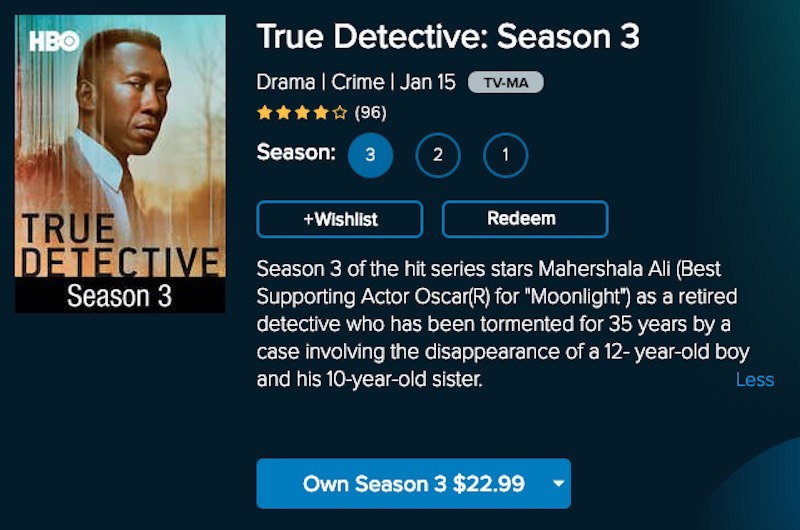 In case you’re locked out of your own iTunes Store and you can’t find True Detective on it, just make a US iTunes account and you’re good to go. Vudu, is sort of the new player in the market but it keeps up with the competition by providing affordable streaming plans and season packages. Another good thing is that it’s almost available on every device because you get to buy or stream the content on its website as long as you have a working browser available. It’s less congested compared to other popular platforms and with a diverse range of titles ranging from True Detective to other famous HBO titles, it certainly does not disappoint. You can even download the episodes individually. No strings attached! So we listed several official ways you can watch True Detective. Even with all these options, none of them may be available to you due to logistical reasons. We’re not asking why you want alternative methods if you have an existing subscription. Maybe the service is down for the moment. We’ve compiled a list of alternatives where you can watch True Detective online in case the official provider is down. But these are not guaranteed to work so don’t expect a flawless streaming experience. You won’t find True Detective on any streaming platform like YouTube. However, it’s a relief to know that when you can’t find what you’re looking for in Youtube, it’s (most) likely on Dailymotion. If you’re feeling lucky, try finding an episode of True Detective on the site. You never know if the official license holder uploaded an episode or two. But as this is an unofficial alternative to other premium streaming sites, expect to find some missing episodes along the way. You’d probably go through a lot of click bait and redirections to shady sites. If Dailymotion does not do the work, try other alternatives such as Putlockers. It’s one of the recommended sites for streaming alternatives since it first got popular with providing streaming options to those living outside of the US. All in all, this site is an alternative that can work but it’s swarming with lots of pop-ups and ads. It won’t be a pleasant experience. As we said earlier, not all of these alternatives are always guaranteed to work, so don’t expect to find all of the episodes you’re looking for in one fell swoop. Alternatively, Google is always dependable, so you can just use the search bar to find episodes you might have missed and you’ll probably find some episodes. Not only is torrenting illegal but they can contain viruses. True enough, True Detective is a commendable series on its own. It’s one of HBO’s gems in the making. However, you know for a fact that the more famous the series is, the more people try to get their hands on it (for free). Given the case, it shouldn’t be surprising to find True Detective on different torrenting sites. May we remind you that torrenting of copyrighted material is illegal and punishable by jail time and fine. It’s completely legal to keep your own copy of True Detective for the sake of having one ready to watch, but its a different situation if you put it for sharing on p2p sites. Not only do you break the law, but you also open your own private network to snoopers. If you are torrenting legally, then make sure you protect yourself with a VPN for torrenting so you hide your activities from the public. It’s worth it. An HBO Now subscription is a good thing to start with if you’re into watching HBO-exclusive titles but not all places in the world can subscribe to it. You can still bypass this restriction and stream as if you’re in the US – you only need to use a VPN! A VPN connects your server to the US so you can still access HBO even if you’re not a resident. You’d be able to stream True Detective on HBO in no time! But as the image above suggests, HBO’s firewalls may be a huge blockade to most VPNs… but not these two below. For ExpressVPN, there’s no firewall too hard to conquer – even HBO’s. Its ability to unblock most streaming sites is what made it the VPN giant as it is today. High internet speeds, strong encryption and torrenting support – its services are top notch. It even guarantees 24/7 customer service so if you’re having trouble connecting to a server or when it doesn’t work for whatever reason, you can always talk to a representative via live chat. Give yourself a go at this premium VPN for only $8.32/month for a year. You won’t regret it. If you’re unsure, just take a look at our ExpressVPN review. If you’re looking to unblock HBO (or any other streaming services) in the long run, then try NordVPN. This cheap premium VPN retails at only $2.99/month for 3 years, so you’re getting the best of both worlds for a long time. If you’re already paying for various streaming services, what’s another $2.99 per month? Just don’t buy that one cup of coffee per month. You can learn all about NordVPN here. With all these recommendations we’ve given, grab some popcorn and head over to your couch to binge-watch! There’s no definite release date for Season 4, so indulge on all 3 seasons of True Detective while waiting. Remember to use your VPN at all times so you can watch anything you want while protecting your privacy and identity.